Top 25 Strollers and Prams to check out! I’ve searched the internet to bring you the best of the best when it comes to Prams and Strollers available worldwide. Most of these brands are already available in South Africa and I am sure that the others will be making their way into Africa soon! ? Baby products have changed tremendously over the years! Brands are spending more time in creating convenient products for parents that are on the go and need to save space. These strollers and prams are trending in the industry at the moment and offer the millennial mom exactly what she needs! ? A stroller (Canada & U.S.A.) or pram (U.K) is a hand-pushed vehicle to carry babies and young infants. Top 25 Prams and Strollers to check out in 2017! I’ve written about Doona on my blog before and now that I own one with the Isofix base, I can’t imagine getting any other car seat for Kiaan right now. Doona™ is the only car seat in the world that goes from car seat to stroller in seconds. Car Seat mode – This mode is intended for use in a vehicle. The wheels are tucked under the Doona body and the handle is placed in Anti-Rebound mode and pressed against the vehicle seat back to prevent rebounding in case of a crash. Doona should only be used in car seat mode when in a vehicle. Pull-Along mode – This mode is intended for walking and maneuvering in tight or crowded spaces. The wheels are out and the handle is in the vertically upright position to allow puling the Doona right alongside the parent. On-the-Go mode – This mode is intended for walking in open spaces – just like a stroller. The wheels are out and the handle is extended in a 45-degree angle towards the parent. For more information on Doona, visit www.simpleparenting.co. I think Mima is so clever for including the carrycot inside the actual system! This brand has options for one or multiple babies. ? Leatherette fabric for easy wipe cleaning. Adjustable handlebar 3 positions to suit the parent. Seat pad with a 5 point safety harness. Reversible seat with a patented “carrycot inside” system. Highly resistant removable wheels, with sports shoe technology so they never deflate. Two height settings to adjust the seat or carrycot. 2 baskets with magnetic lids. For more information on Mima, visit www.mimakids.com. I love this stroller! It fits perfectly in my mini cooper and it is super easy to clean! Fully reclinable – Easywalker Buggy is fully reclinable with 4 different positions to choose – for the child to sleep, sit up or relax. Suitable from birth – Easywalker Buggy can be used from birth till the child reaches 20kg of weight, lasting you many years. Lightweight – Made of high quality, lightweight aluminum, the buggy weighs only 6.5 kg including canopy basket and inlay so it is perfect for carrying and traveling. Car seat compatible – Most car seats can be easily fixed on the frame using adapters with one click, so if the child sleeps in the car no need to take her out to transfer to the buggy. 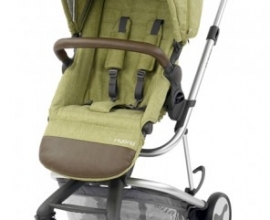 Stylish and comfortable design – Various beautiful colours and prints make this buggy truly stand out. The fabrics can be easily cleaned if the child spills something. The perfectly padded seat gives maximum comfort to the child, just like you want. Ergonomic handles – Handles are made of high-quality leatherette in an ergonomic style to give you the right grip of the buggy while making a statement. Smooth ride – With wheel bearings and four-wheel suspension, the buggy gives your child a smooth ride even on rough terrains and has a convenient foot brake when you want to stop. Swiveling front wheels can be locked when desired. Easy to fold and carry – The buggy has an easy umbrella fold with an automatic folding lock and can be carried over the shoulder with the attached non-slip strap keeping your hands free. Safety features – A 5-point harness with soft harness pads ensures the child is safely strapped in. Harness allows both left and right side to be individually fastened for your convenience. For more information on the Mini easywalker buggy, visit www.easywalker.nl. Can be used with carry cot, stroller seat, car seats and optional sibling solution. Lockable swivel wheels make it easy to maneuver in tight spaces. Lightweight, robust chassis with large shopping basket is easy to fold and light to carry. High carry cot and stroller seat position brings the baby closer to mom and dad. Spacious carry cot with soft interior lining provides a comfortable environment for the baby. Soft, padded seat with an extra cushion that reduces the seat depth to fit the smallest babies. Adjustable ergonomic foot rest on the seat eliminates dangling feet. For more information on Stokke, visit www.stokke.com. From birth, baby lies parent-facing and never leaves your sight. BABYZEN YOYO+ comes with a totally flat carry cot for infants and a 5-point harness, a 3-position pop up canopy, a foot cover and a headrest. From 6 months and using the same frame, simply swap 0+ newborn fabrics to 6+ fabrics, and sit baby up to face the road. Time for him to discover the world! The YOYO+ backrest can be inclined to 145° in several positions and features comfortable padding with a 5-point harness. YOYO+ is even more comfortable – new 4-wheel suspension, ultra-padded 6+ seating, and a new carrying strap.YOYO+ provides, even more, protection – new extensible canopies with UPF 50+ solar protection in the 0+ and 6+ versions, and new rain shields providing full coverage to 0+ and 6+ strollers. YOYO+ is, even more, sturdy – a stronger frame and certification up to 18 kg. For more information on BabyZen, visit www.babyzen.com. Bugaboo has a stunning range available for baby or babies. ? Two seats facing the world. Two seats facing each other. One piece fold with bassinet(s) and seat(s). Easy to store at home or in the car. Independent use of seat and carrycot. Recline or reverse the seat with just one hand, always having one hand free. For more information on Bugaboo, visit www.bugaboo.com. 2 different types of seats. For more information on the Cybex Priam, visit www.cybex-online.com. Suitable from birth (with carrycot) or 6 months (pushchair & seat unit) up to 15kgs per seat unit. Optional extra lie-flat carrycot for newborns, which is suitable for overnight sleeping. Lockable front wheels / Removable rear wheels. Smooth-rolling, puncture proof EVA tyres. All round suspension for a smooth ride. Unique (pop-up) one hand seat and carrycot removal. Elevator adaptor allows seat unit to be heightened in parent and world-facing mode. Leatherette handle & bumper bar. Comes complete with elevator & raincover. For more information on iCandy, visit www.icandyworld.com. Front and rear facing toddler seat. Shock-absorbing front & rear suspension. Fabrics are removable and washable. Performance Travel System compatible with MESA Infant Car Seat – direct attachment, no adapters necessary. 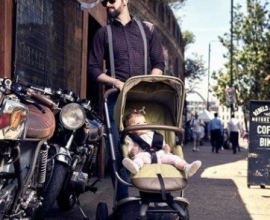 For more information on UPPAbaby, visit www.uppababy.com. Powder-coated glossy chrome chassis with C-spring suspension and pneumatic wheels giving that gentle cloud-soft bounce for an ultra-smooth glide. Baby car seat (group 0+) with dual-function base, pop-off hood, adjustable harness, newborn support, plush padded liner for added comfort, padded removable bumper bar and tough side-impact wings for added security. Superior adjustability from the multi-position handle to the pushchair seat’s luxury leg rest and seat back. Wonder brings protective, supportive cocooning from birth to 15kg. Thoughtful detailing from fresh air windows, extending tuck-under visors, tailored raincovers, extra large basket and discreet storage compartments. Certificate of authenticity and original Cosatto 4 year guarantee. Tailored luxury 3 way pushchair Cosy Toes lined with padded sumptuous weave for ultimate comfort – ribbed knit (Kew), boucle (Hepburn), cable knit (Bonbon). Matching full couture bag with changing kit. Handy fold-away adaptors for car seat. For more information on Cosatto, visit www.cosatto.com. For more information on gb Pockit, visit www.gbchildusa.com. Three linear stages allow you to switch as you go with easy, one-handed expansion. Market tote and lower storage area expand with stroller to carry extra-large items. Seat has five recline positions and an adjustable footrest to accommodate children from birth to 50 lbs. Compact, self-standing fold possible without removing secondary seating. Fashionable fabrics and finishes offer style, quality, and durability. For more information on Austlen, visit www.austlen.com. Removable seat for easy transformation into a stylish frame carrier for the KeyFit®. Capacious basket easily accessed from front or rear. Features one-hand fold, auto-positioning wheels and a self-standing compact folded position. Includes a convenient parent tray with storage and cup holders. RideRight® Bubble-level Indicators on each side of the base indicate accurate fit to vehicle seat. SuperCinch® One-pull LATCH Tightener with force multiplying technology to achieve a tight, secure fit with a fraction of the effort. Seat interior lined with EPS energy-absorbing foam for improved impact protection. Smooth underside of base helps protect against damage to vehicle seats. Easy vehicle belt routing and a built in lock-off system accommodate vehicles without LATCH. FAA approved for use on an aircraft. For more information on Chicco, visit www.chicco.co.za. Adjustable, telescopic handle for mom and dad’s comfort. Large rubberised wheels that are puncture free. Suspension on front and rear wheels make it a softer ride for moms and babies. Single swivel front wheels are lockable. Large, spacious shopping basket with centrally located zips for easy loading and unloading. Folds with frame. Large sun canopy offers protection from sun and rain. Has a carry cot and toddler seat option. For more information on Double Trouble, visit www.double-trouble.co.za. Lightweight aluminium chassis is easy to maneouvre with active little riders. Suitable from birth with flat reclining seats. One hand fold with automatic fold lock. Free standing when folded and fits in a boot. Reversible, double seat liner features two stylish options. Both seats are individually adjustable for a customised ride for each child. Multi-position, flat reclining seat provides backrest recline options for either child. Multi-position calf support gives two comfy options. Adjustable hood features a sun visor and peekaboo window. Shopping basket is deep to hold and secure personal items. All wheel suspension for a smoother ride on rough surfaces. Front swivel wheels lock in place as needed. Removable and pivoting armbar gives added security and allows for children’s safe entry or exit. Single step, ShoeSaver brake keeps shoes scuff free. SoftTouch, 5-point harness system adjusts to 3 heights to keep children extra secure. For more information on Joie, visit www.joiebaby.com. True flat sleeper recline seat. Tough, foam filled, airless tires. Pairs perfectly with the PIPA™ car seat. One-piece fuss-free, compact fold no matter which way the seat is facing. Oversized, protective UPF 50+ canopy with removable, flip out eyeshade & integrated mesh panels. For more information on Nuna, visit www.nuna.eu. Swivel front wheel for easy maneuverability, locks into place for jogging. Ergonomic handlebar with a range of heights for parent’s comfort. Rear suspension for a smooth and comfortable ride. Padded seat with vented top reclines to a near flat position for on-the-go naps. One-handed compact fold for storing and transporting. Large storage compartment with zippered water resistant cover. Multi-position canopy for added protection with view-in roof port to see your child. For more information on Thule, visit www.thule.com. Suitable from birth to around 15kg. Adjustable handlebar for comfort and control. Seat unit can be used either world or parent facing. Super-compact fold for easy storage. Luxury lined hood and visor. UPF 50+ fabrics for optimal protection against UV rays. Peek-a-boo window allows you to check on your little one. Car seat compatible (adaptors may be required). For more information on Mamas & Papas, visit www.mamasandpapas.com. The wheel suspension absorbs every bump in the road for a smooth stroll on any surface. For more information on Quinny, visit www.quinny.com. • Removable and machine washable seats. • Height adjustable shoulder harness. • Foot-operated linked parking brakes. • Ultralight flat-free EVA tires. • Extendable UPF 50+ sun canopy and built-in sun visor. For more information on Maclaren, visit www.maclaren.us. LCD dashboard displays distance, speed, calorie burn, temperature, time, and battery level. Self-charging via generators in rear wheels. Grows with baby: carriage, parent-facing seat, and forward-facing seat modes. Dashboard bag & storage basket. Swivel locks on front wheels for rough terrain. Full coverage canopy with pop out shade. Front & rear wheel suspension. For more information on 4moms, visit www.4moms.com. A chic, unique ride from the moment baby enters the world through toddlerhood. Pairs perfectly with the PIPA icon & PIPA. Stands on its own when folded. Removable, extendable canopy with flip out eyeshade. Flat sleeper seat allows for plenty of space to sleep or stretch. Height-adjusting handle for drivers small and tall. For more information, visit www.nuna.eu. Adjustable handle – The handlebar is fully adjustable with 5 different height positions, adjusted with a rotating barrel, all beautifully finished in hand-stitched leatherette. Two-way reclining seat – The curved seat design is suitable from six months of age up until 25kg when used as a single stroller and 15kg per seat when used as a tandem stroller. It incorporates 3 recline positions, reversible seat to be front and parent facing, 3 position hood and a beautifully finished leatherette swing away hinged bumper bar. Adjustable Leg-rest – The pivoting adjustable leg-rest allows you to easily support your child’s feet as they grow, and also incorporates a discreetly placed insect net underneath. Adjustable canopy – Made out of soft, luxury fabrics, the egg® hood has a silent and smooth fold to 3 adjustable positions. The hood can also be moved to higher positions up the chassis if needed. Insect net discreetly placed underneath leg rest. For more information on the Egg stroller, visit www.babystylesa.co.za. Push handle with 4 adjustable height positions. One-hand backrest with 5 position recline. Removable parent tray and cup holders. Lightweight aluminum frame with one hand folding Mechanism. Puncture proof wheels with adjustable shock absorbers and front swivel wheel for maximum manoeuvrability. One-hand locking levers conveniently located near the handle. One that activates the brakes and the other that locks the front swivel wheel. Extendable hood with UV50+ protection. Folds compactly and stands upright when closed. Suitable from birth -3 years (birth up to 15kgs). Most of these Prams and Strollers are available in South Africa in stores and online. Which is your favourite Pram or Stroller? Hello 🙂 I’m Shan. Wife to Vije Vijendranath, Mom to Kitana and Kiaan. I’m a Parenting and Lifestyle blogger based in Johannesburg, South Africa. My blog is about my journey through motherhood and the little bumps on the way.